Nettex VIP In The Balance is a concentrated formula of vitamins, minerals and trace elements, that is ideal to improve the diet of leisure and competition horses. In The Balance provides concentrated nutritional support in one easy to feed supplement. Its V.I.P.® formula is designed to meet your horse’s advanced nutritional needs for health, vitality and performance. 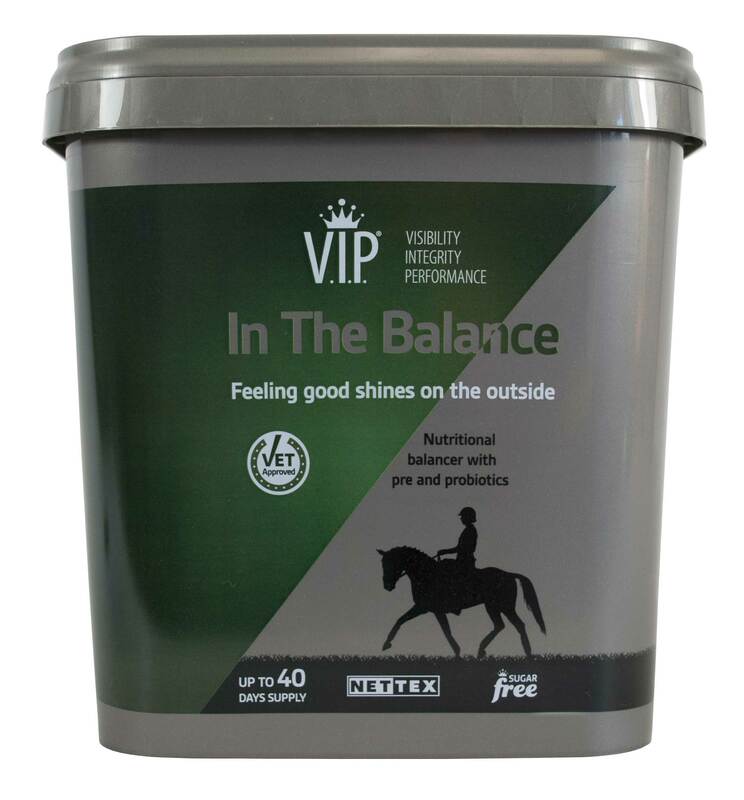 In The Balance is Vet Approved and contains a concentrated package of vitamins, minerals and trace elements to improve the diet of both leisure and sport horses. Nutritional support of the gut is fundamental for horses’ health. In The Balance supplies prebiotics and probiotics to help optimise gut function and healthy digestion. ADVANCED AND CONCENTRATED NUTRITIONAL SUPPORT. PREBIOTICS AND PROBIOTICS - To support healthy digestion. Most horses do not receive a full ration of hard feed which means they can miss out on vital nutrients. In addition, vitamins and minerals are often low in preserved forage, such as hay or haylage, and where grazing is less than optimum. Even minor shortfalls can lead to poor performance or a lackluster appearance. Feed In The Balance daily to ensure your horse receives essential nutrients required for a balanced diet to help him enjoy perfect health.